This utility works properly on Windows 2000, Windows XP, Windows 2003/2008, Windows Vista, Windows 7, Windows 8, Windows 10. On 64-bit systems, you have to use the 64-bit version of OpenedFilesView. Older versions of Windows (NT/9x/ME) are not supported. Also, you must have administrative privilege in order to run this utility. In order to solve this issue, you have to manually extract the content of the zip file into a folder, and then run it from there. Fixed OpenedFilesView to send the data to stdout when specifying an empty string (e.g: OpenedFilesView.exe /scomma "" ). Added new option: 'Copy Locked Files To Another Folder' (F7), which allows you to copy locked files that cannot be copied with Windows Explorer. Be aware that this feature doesn't work if the file is opened by 'System Process'. OpenedFilesView is now a Unicode application so it can display and save filenames with any character (Until now non-ANSI characters were displayed as '?'). Added 'Quick Filter' feature (View -> Use Quick Filter or Ctrl+Q). When it's turned on, you can type a string in the text-box added under the toolbar and OpenedFilesView will instantly filter the files list, showing only items that contain the string you typed. Added 'Close Processes Of Selected Files'. As opposed to the 'Kill Processes Of Selected Files' option that brutally kills the process, this option sends a request to the application to close itself as soon as possible (using WM_QUERYENDSESSION and WM_ENDSESSION Windows messages). Added new information to 'Attributes' column: 'T' for 'Temporary File', 'I' for 'Not Content Indexed', 'E' for encrypted file, 'X' for 'No Scrub File', and 'V' for 'Integrity Attribute'. Explorer context menu inside OpenedFilesView: When you right-click on a single item while holding down the shift key, OpenedFilesView now displays the context menu of Windows Explorer, instead of the OpenedFilesView context menu. Fixed bug: OpenedFilesView failed to remember the last size/position of the main window if it was not located in the primary monitor. Finally, fixed the error 100005 problem occurs in some systems. Added a small fix that hopefully will solve the error 100005 problem occurs in some systems. The 64-bit version of OpenedFilesView is now provided with a signed driver, so there is no need for driver signing test mode anymore..
Added 'Open File Folder' option (F8), which opens the folder of selected file in Windows Explorer. Added 'Mark Files With Position Change' - When it's turned on, files with position change are marked in green color. Added '% Position' column - Displays the position of the file in % , relative to the current file size. Fixed bug: OpenedFilesView failed to close network files from command-line. /filefilter now allows you to specify a filename without a path. For example, if you run OpenedFilesView with '/filefilter index.dat', all opened index.dat filenames will be displayed. Added command-line option for sorting the list in the save command-line options. When saving from command-line, OpenedFilesView now only save the items according to the options selected in the last time that you used it. For example: if the 'Show Opened Directories' options is unchecked, opened directories won't be saved into the file. Added 'Explorer Copy' option - You can selected one or more files, choose 'Explorer Copy', and then paste them into Explorer window. Added drag And drop icon in the toolbar that allows to to easily view only the opened files of the desired application simply by dragging the target icon from the OpenedFilesView toolbar into the application. Fixed bug: Extension column displayed wrong value when folder name contained a dot character. New option: Hide System Process Files. New option: Hide Svchost Files. Added error message when OpenedFilesView fails to load the opened files list. Fixed bug: When using command-line options, the opened files of OpenedFilesView itself were added into the list. Added new option: Convert short-path names to long-path names. Added file extension column, so you can sort the opened files list by file extension. Fixed bug: AutoRefresh sub-menu selection wasn't displayed. Fixed bug: The main window lost the focus when the user switched to another application and then returned back to OpenedFilesView. 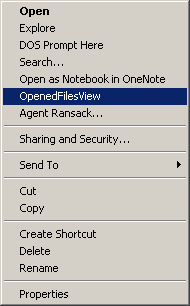 Version 1.11: Fixed bug: OpenedFilesView displayed wrong files when running it from context menu on a folder. Version 1.04 - A small fix in NirSoftOpenedFilesDriver.sys to avoid crashes when a memory address of kernel object is invalid. Version 1.03 - Improved file closing under Vista. Version 1.02 - A tooltip is displayed when a string in a column is longer than the column length. Version 1.01 - New option: Hide Files In Windows Folder. OpenedFilesView uses the NtQuerySystemInformation API to enumerate all handles in the system. After filtering non-file handles, it uses a temporary device driver - NirSoftOpenedFilesDriver.sys for reading the information about each handle from the kernel memory. This device driver is automatically unloaded from the system when you exit from OpenedFilesView utility. The main window of OpenedFilesView display the list of all files currently opened in your system. In order to refresh the list of opened files, press F5, or alternatively, use the Auto Refresh feature (Options -> Auto Refresh -> Every x seconds) in order to automatically refresh the opened files list every 1 - 5 seconds. Starting from version 1.10, you can launch OpenedFilesView directly from Windows Explorer, and view only the handles of the file or folder that you want to inspect. In order to enable this feature, check the 'Enable Explorer Context Menu' under the Options menu. After you enable this feature, you can right-click on any file or folder on Windows Explorer, and choose the 'OpenedFilesView' item from the menu. If you run the OpenedFilesView option for a folder, it'll display all opened files inside that folder. If you run the OpenedFilesView option for a file, it'll display all opened handles for that file. Show Opened Directories: By default, OpenedFilesView only display the opened files. If you also want to view the opened Directories (folders), select this option. Show Network Files: By default, OpenedFilesView only display the opened files on your local drives. If you also want to view the opened files on remote network drives, select this option. Sort On Refresh: If this option is selected, new opened files (after refresh) are added to the right position according to the current column sort. If this option is not selected, new opened files are added to the end of the opened files list. If you want to view only the opened files of specific application instead of the entire system, you can drag the target icon of the toolbar into the window of the desired application. Whenever you want to view all opened files again, simply use the 'Clear File/Process Filters' option. /stext <Filename> Save the list of all opened files into a regular text file. /stab <Filename> Save the list of all opened files into a tab-delimited text file. /scomma <Filename> Save the list of all opened files into a comma-delimited text file. /stabular <Filename> Save the list of all opened files into a tabular text file. /shtml <Filename> Save the list of all opened files into HTML file (Horizontal). /sverhtml <Filename> Save the list of all opened files into HTML file (Vertical). /sxml <Filename> Save the list of all opened files to XML file. /sort <column> This command-line option can be used with other save options for sorting by the desired column. If you don't specify this option, the list is sorted according to the last sort that you made from the user interface. The <column> parameter can specify the column index (0 for the first column, 1 for the second column, and so on) or the name of the column, like "Filename" and "Created Time". You can specify the '~' prefix character (e.g: "~Created Time") if you want to sort in descending order. You can put multiple /sort in the command-line if you want to sort by multiple columns. OpenedFilesView.exe /shtml "f:\temp\1.html" /sort "~Write Access" /sort "Filename"
/closefile <Filename> Close all handles of the specified filename. /closefolder <Folder> Close all handles of all files in the specified folder. /closefile killprocess <Filename> Kill the process that opened the specified filename. /closefolder killprocess <Folder> Kill the procsses of all files in the specified folder. /closefile closeprocess <Filename> Close the process that opened the specified filename. /closefolder closeprocess <Folder> Close the procsses of all files in the specified folder. /filefilter <Filename> Start OpenedFilesView with file/folder filter. If you specify a file, only the opened handles for the specified file will be displayed. If you specify a folder, all the opened files under the specified folder will be displayed. /wildcardfilter <Filename> Start OpenedFilesView with the specified wildcard filter. /processfilter <Filename> Start OpenedFilesView with process filter. When you use this filter, only the files opened by the specified process will be displayed. You can specify the full path of the process file, or only the filename without path. OpenedFilesView.exe /processfilter "F:\Program Files\Mozilla Firefox\firefox.exe"
OpenedFilesView allows you to easily translate all menus, dialog-boxes, and other strings to other languages. A file named OpenedFilesView_lng.ini will be created in the folder of OpenedFilesView utility. After you finish the translation, Run OpenedFilesView, and all translated strings will be loaded from the language file. If you want to run OpenedFilesView without the translation, simply rename the language file, or move it to another folder. OpenedFilesView is also available in other languages. In order to change the language of OpenedFilesView, download the appropriate language zip file, extract the 'openedfilesview_lng.ini', and put it in the same folder that you Installed OpenedFilesView utility.